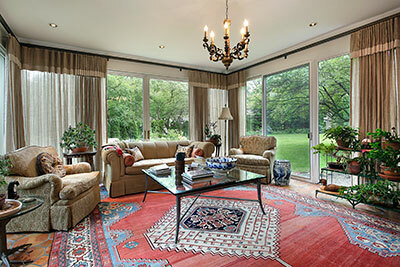 Fine Oriental rugs and area rugs are one of our specialties at Palm Beach Oriental Rug Cleaning Pros. Our cleaning professionals have extensively studied fine Oriental Rugs from all around the world to ensure they are cleaned to the fabric’s needs. We can even remove pet urine odors and stains. Our team will also give special attention to your rug’s delicate fabric and fringe. Your rugs are an investment and many times, family heirlooms, and regular cleaning by our experienced cleaning professionals will help preserve their beauty and value. For your convenience, we offer complimentary pick-up and delivery service for your Oriental and area rugs in Riverbend Country Club in Tequesta, FL. Additionally, businesses like law firms, hotels, banks, medical offices, and more display fine rugs as part of the image they project to their clientele. Over time, these rugs become dirty and damaged due to traffic and wear and tear. We take pride in handling your business’ needs. We have the knowledge, expertise, and equipment to wash and dry your business’ fine rugs. Our team and facility are equipped to handle large quantities of rugs without sacrificing quality of care and attention to detail. Trust us to restore and revive your business’ rugs so you can maintain a clean, professional, and impressive interior that you feel good about. At Palm Beach Oriental Rug Cleaning Pros, we’ve refined our rug washing process to be the best anywhere, bringing years of experience along with the best equipment for cleaning down to the fibers of every rug we see. We use a hands-on approach to ensure that your rugs receive the utmost quality of care. Our team knows how rugs are constructed and where dirt and odor hides. We won’t rest until we’ve delivered your rug perfectly clean, and we stand by our work with a 100% satisfaction guarantee. We take care of our business customers through personal attention and exceeding quality, price, and service expectations. A member of our experienced team will be committed to your account and on-hand to facilitate your family’s or business’ needs. At Palm Beach Oriental Rug Cleaning Pros, we understand that fine area rugs require extra time and attention in the cleaning process. These beautiful rugs are prone to shrinkage, bleeding, and other problems if they are not cared for properly. Our professional-grade deodorizer will also help with odors caused by mildew, smoke, pets, and other nasty smells and will leave behind a fresh scent. Most high quality rugs—even those that are machine made–can cost a small fortune and unless damaged beyond repair, should be professionally cleaned occasionally. Rugs that are one-of-a-kind, antique, Oriental, etc. require even more specialized cleaning care, in efforts to protect their worth and maximize their life. Many of the best rugs in the world are hand-woven and hand-dyed using Old World techniques. The rug could be a family heirloom, a prized find from a flea market, or a special memento purchased while on vacation. Each is an individual work of art. We are your rug cleaning specialist!